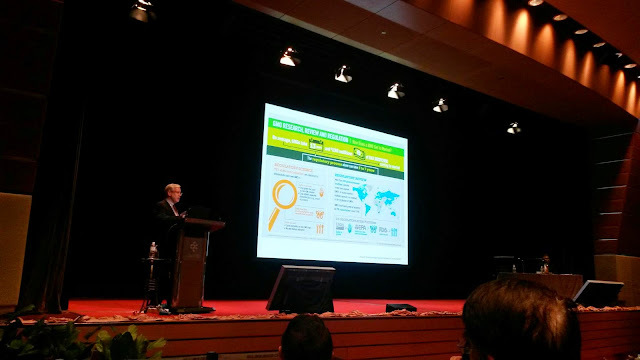 On Wednesday morning I had a long 1 hour session to present on "Downstream merchandising of palm oil - adjusting for sustainability" with a Q&A after. Thanks to Trueventus for inviting LMC International. I presented on various key statistics for downstream example the oddity of number of trademarks on sustainable palm oil versus number of products being launched with the troubling "palm oil free" label. One palm oil merchandiser (some months ago) pointed out to me that certification to use a trademark to highlight the presence of palm oil is not what many manufacturers want to do. They would rather remain silent on the issue. This may explain the above factoid. Because of this apparent shyness, the logic is that a (presumably cheaper) traceability program that is more inclusive of the supply chain is a good alternative as it may be that the need is for a sort of insurance on the supply chain and not marketing publicity. Let's see how the marketing on sustainability / traceability evolves on this. Downstream players also need to pay attention to their upstream sourcing strategies as traceability both within and outside certification points to a palm oil mill risk rating system. Post conference, I hit the super market next to the conference venue and stocked up on Indonesia snack foods (instant noodles with a wonderful range of local regional tastes; flavoured chips / crisps from tapioca - spicy ones with lime / lime leaves especially caught the eye e.g. keripik singkong balado dengan daun jeruk) and ready mix sauces for Indonesia favourites like soto ayam, sop buntut, opor ayam and more. Indonesia domestic consumption of palm oil is very big, given the country's large population. However, I agree with a friend that the supermarket aisles in Thailand may have an even larger range of domestic processed and ready foods. Day 2, I was the first presentation of the day at the morning session in the technology grouping. However, while sustainability may be a technical and/or CSR issue, I focused on the commercial and strategic business issues relating to it. Day 1 was busy with meetings. President Jokowi unable to attend after all. It's a huge crowd here. Good to see industry friends and meet more. I was here two years ago (venue was Bali), speaking on sustainability and I'm speaking on the same topic early this morning, with some nice data courtesy of work at LMC International. It's a big crowd here and its one of the must-go events of the palm oil calendar (with the highest production values and effort). At GAPKI's Bandung conference this afternoon, Dr James Fry of LMC International (yes, where I work) will be talking about the energy sector prices in relation to palm oil prices. Energy sector cost of production indicators will also be referred to. That will be worth checking out. These were two useful events. Papers not freely downloadable though. /khorreports-palmoil/2014/11/rspo-roundtable-rt12-2014-is-around.html and also search "RT12" in this site. 5 November 2014: At OFIC KL 2014 conference. MOSTA is the key organiser. OFI Congress Programme - organised by MOSTA; http://www.ofievents.com/asia/ofic. Awaiting downloadable presentation. This is AOCS speaker on consumer attitudes and a nice infographic on GMO.